There's quite a few options out there today when it comes to miniature model transports for wargaming. 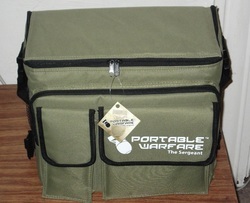 The latest company to step up to the plate with a carrying case is Portable Warfare. They're a new small company, which operates from the Sunshine State, Florida. Their debut product is called the Sergeant. This is a rundown of the features direct from their website...8" x 8" velcro front pocket, 4" x 8" velcro front pocket, 2 side drink holders, Cargo Net in the back, Bag Dimensions 12"H x 13"W x 7"D, Removable Strap and Stacking clasps on top and bottom. I'm surprised to learn that they didn't even list all of their own features for the bag. There's also a velcro pocket on the inside of the lid flap. I'm not quite sure where there's a front pocket with the dimensions 4x8 that they list, but on the front of the case there's a skinny velcro pocket and a large velcro pocket. The main front pocket is a zipper pocket too, which they also didn't mention. 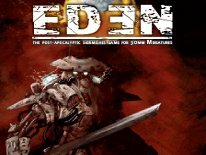 I tested it out with the 300+ page hardcover BattleTech rulebooks Total Warfare, A Time of War and the Tech Manual, and any of those books fit just fine with a wee bit of room to spare. The material feels like a canvas-like fabric, and the stitching seemed tight and durable all around. The Sergeant looks to be constructed very well. This is also a softbag just like the majority of the Sabol offerings. As for the features they mentioned... The cargo net on the back of the case is large enough to fit most any standard size rulebook, even some thicker ones like the BattleTech tomes I tried out in the front pocket. The two front velcro pockets also expand enough to fit most of the gaming essentials (stat cards in top loaders, dry erase markers, tape measures, beads/counters, a couple of Snickers, etc). The drink holders can double for holding a dice brick, cell-phone, etc. Inside you can fit a little under 12-inches worth of foam trays, and the trays they use are the Blu branded foam trays. For the record they sell the Sergeant cases empty, but Portable Warfare offers two different loadouts of Blu trays as an option for someone who wants a case with foam trays included, since they don't make their own trays. The loadout I was sent includes 1x 3-inch Blu tray, 2x 2-inch Blu trays and 2x 1.5-inch Blu trays. The other option is Loadout #2 which includes 1x 3-inch Blu tray, 1x 2-inch Blu tray, 1x 1.5-inch Blu tray and 3x 1-inch Blu trays. If you're not familiar with the Blu trays, they're almost identical in dimensions to the Sabol Designs trays, but are cut with rounded corners, and the backing foam is blue instead of black. With the assortment included with this case (Loadout #1 option), I measured 11.5-inches in Blu trays, as the trays are all actually 1/4th of a inch thicker than the said size, due to the backing foam. I measured the complete usable space on a Blu tray, and on a Sabol Designs foam tray, and both measure the same at 6.75 inches top to bottom and 12-inches across the length of the trays. To be exact the area I measured is where the pluck foam can begin being plucked, to the other edge where it can begin being plucked top to bottom and lengthwise both. Therefore in terms of the full capacity of each tray, they're literally identical. I thought for sure that cutting the corner on the Blu backing foam might have taken some storage space away, but it didn't. If the rounded corner design is useful, or just for show can be debated I'm sure too. Some might be able to say that the rounded corner makes it a little bit easier to get the trays out of a bag. When you're using a case that zippers down to reveal the entire stack of trays, then that feature is redundant. The Sergeant does zipper like a traditional Army Transport opening from the top, but also if you zipper it down further the entire side falls away to reveal the entire stack of trays. So the rounded corner design of the Blu tray serves no purpose in this case (no pun intended). I'm honestly seeing no difference between the Blu trays and a standard Sabol Designs tray outside of the fact that they're blue and have rounded corners. One of the complaints people have had with the Sabol trays for years is that the glue meant to seal the backing to the foam can sometimes stick to models. This can occur when you pluck away the foam from the outermost edges of a tray, which is where the tray backing is glued to the pluck foam body The Blu trays are no different in this respect. As my one photo reveals, as soon as I plucked some squares out of the Blu tray, the glue was not only staring me in the face, it was very sticky and ready to pluck the paint off my models! I'm really not complaining about the glue issue either, because the Sabol trays have had the same problem for years now, only with those trays it's hit or miss with the glue issue, because they've been aware of it for years, and they've done their best to avoid it. I'll give Blu the same benefit of the doubt, that I'm sure not every Blu tray will be this way, but some no doubt will have that problem. There's a temporary fix for that issue too, which is why it doesn't upset me too much. The easiest way to remedy the issue is to take a piece of foam you plucked away and jam it right on top of the sticky spot, and let it be a buffer between your model and the glue spot. That's what I did with the Blu tray when I put my Mechs in one of the trays. Now I'm able to use the tray without any worries. The owner of Portable Warfare was also waiting for new stock of trays from PHD (makers of Blu foam) right before I was sent the bag and trays for review, and what I was sent were brand new straight from the Blu factory too. Which totally explains what I encountered. Fresh glue is always the culprit. The glue will eventually dry and harden on any of these trays. In the end it's clear that the Blu trays aren't any better, or any worse than a Sabol Designs tray. From my point of view they're 99% identical in every way, except one of the two has a rounded corner blue backing foam. It was pointed out as well that the blue backing foam on each Blu tray is supposed to be stronger, offering more stability than a Sabol tray when loaded with models. I checked that claim, as I looked at both trays side by side and I'm not seeing that one is any stronger than the other. I do know that sometimes with any of these pluck trays, if you overload a tray and pluck away too much foam that you do end up with a tray that's less stable, because the backing foam relies on what's left glued to it for some of the overall tray stability. So if you end up with a tray that's completely full and has only bits and pieces of foam left for walls in between models, sure that tray will be less stable, because common sense dictates that there's no structural integrity left to support all the weight. A single backing board alone isn't going to fix that problem. It should also be known that Portable Warfare has partnered with PHD/Blu foam to sell the trays with their cases, but doesn't make or design Blu foam. Portable Warfare just makes the case. You also don't need to buy their case with any foam trays at all, because they come standard without the Blu foam. They just offer the Blu foam in two different package deals to get you everything you need in a carrying case all at once. I was sent a full case with a full Blu foam load-out, and that's the only reason I even mentioned the Blu foam trays at all. Back to the topic of the case. I also found it funny that the clasps on the top and bottom of the case will link right up with a Sabol Designs case. I have a few of the Army Transport Platoons lying around and when I saw the design I had to try it. And to my surprise you can link up an Army Transport Platoon to the Sergeant or a Sergeant to an Army Transport Platoon. I'm sure this was meant so you could link a Sergeant to another Sergeant, but since the clasps are nearly identical to the Sabol clasps, they just happen to link with them too. So if you have an existing Sabol case, the Sergeant can link up and piggyback off of it, or vice versa. If I had to compare the Sergeant to any other product out there, I'd say it is most like the Army Transport Mark II. Feature for feature the Sergeant is almost identical to the Mark II, but adds some features of its own too. on it to reveal the stack of trays. Also the Sergeant on the outside is made from a different material. On the inside the Sergeant looks just like any of the Army Transport cases, because they all resemble a vinyl six pack cooler with that same silver-ish/gray vinyl padded interior. The dimensions of an Army Transport Mark II is also 14"H x 14"W x 9"D, with a 13-inch capacity for trays. The Sergeant is 12"H x 13"W x 7"D, and has roughly a hair under 12-inch tray capacity, which is a tight squeeze. Realistically I have 11.5-inches total in there now and it's a tight fit, so I'd say it's a safer bet to stick with no more than 11.5-inches total in trays. Again taking into account all pluck trays be it Sabol or Blu foam have 1/4th of an inch foam backing boards, you're really only going to fit roughly 11-inches of actual models in either of these cases. The only difference is that the Sabol Army Transport Mark II case is going to allow you to do so with a little more breathing room since it's a little deeper in depth. The big question is, do I think this is better than the Army Transport Mark II? Well let me put it this way, the Army Transport Mark II is $34.99 empty. The Portable Warfare Sergeant is $37.95 empty. If it was a matter of money, the Mark II is cheaper, and it will handle the storage and transportation of models task just as well as the Sergeant. However both cases hold very close to the same number of trays in inches, and if you took photos of the cases from the inside you couldn't tell which case you were looking at. The majority of the differences are cosmetic and limited to the exterior between the two products. I like the means to load or unload from the top, or the side both, so the Sergeant wins there. Both cases have that big front pocket with a zipper, rear cargo net pockets, and two front pockets with velcro, the only difference is that the Sabol bag has two compartments of the same size, but the Portable Warfare case made one of their two front velcro pockets bigger than the other, and they're an inch taller than the Sabol pockets, so they're both taking up almost the same real estate in the end. There's one more thing that the Sergeant has over the Sabol cases. The Sergeant comes in three different colors. The Sabol cases are all the same color. You can order an Army Green, GunMetal Gray or Chaos Pink Sergeant case. At present the Pink ones are out of stock, because those actually sold out very soon after the website made them available. I was sent the Army Green version for review. Now that all of the facts have been presented, I have to admit the Sergeant is pretty much a nicer looking Army Transport Mark II, only with a couple more bells and whistles. Between the two cases alone you're talking about the price difference of just $3. 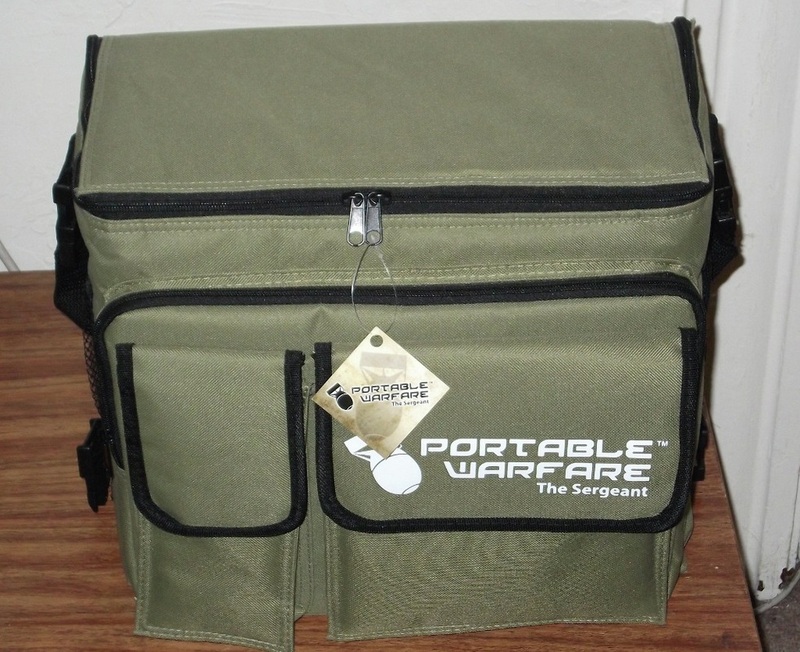 I should also add that the BattleFoam bags have some really nice bells and whistles and hard wall designs too, but both the Portable Warfare and Sabol Designs offerings are substantially more affordable than any thing from BattleFoam. I only used Sabol to compare the Sergeant too, because it's really the only closest competitor feature for feature, and both are close to being in the same price range. As for the Blu trays. They're actually $1.50 more per tray on average over standard Sabol trays, and aside from a rounded corner and a blue backer foam, they're identical in most every way. My advice would be if you're in the market for a new case, the Sergeant isn't at all a bad option, but if you were to purchase one I'd take the money you planned on spending on trays and buy the Sabol trays instead saving a few bucks overall. Blu is attempting to claim they're a better design, but I think what ever money they spent on research and design was wasted, because in use I find that they're no different than a Sabol tray, but cost considerably more. Actually the Sabol trays are all the same price ($8.50 each), but the Blu trays begin to go up in price as you move up to the thicker sizes too. Even IF the blue backing board on paper is more rigid than Sabol's, most gamers take care when handling their trays any how, and no single more rigid backing foam is worth the difference of +$1.50 more per tray. Making matters worse a 3-4 inch Blu tray is $$3.00-3.50 per tray more than a Sabol tray too! That's insane pricing, and in this economy it's outright ignorant of PHD to think gamers are that stupid. They're nice trays yes, but if I'm going to pay that much more per tray, I might as well toss in a few more dollars and jump up to the next level to pay BattleFoam's ludicrius prices for a newer laser cut form fitting foam tray design for my models. They both have the same exact positive and negative features. I see no reason to pay more for trays of a different color when they're going to be inside the case most of the time any way. The color of the exterior of the case however, that just might be worth paying $3 more to some gaming enthusiasts. The sergeant certainly looks nicer than the existing Sabol bags, but it's not a revolutionary step beyond any of the existing designs out there either. Quite frankly Portable Warfare just prettied up an existing carrying case design that clearly works (the Army Transport II), by putting their own twist on it and brought them to market. Which isn't a bad thing at all, because it really is a nice case and they managed to put it together and bring it to market for just $3 more than the competition. The way I see it gamers now have another solid option to choose from, and options are always good.